Boston Fish Market processes hundreds of thousands of pounds of fish per week. We service some of the nation's top food distributors as well as some of Chicagolands finest restaurants. As such, our seafood processing is not only efficient, but also meets very exacting sanitary standards. From salmon filleting machines to pinboning machines to huge refrigerated processing rooms, full-body sanitary overgarments, we are not only committed to top-of-the-line technology, but also to ensuring that each order comprises only the very highest-quality in fresh seafood. On December 18, 1995, The Food and Drug Administration (FDA) published as a final rule 21 CFR 123, "Procedures for the Safe and Sanitary Processing and Importing of Fish and Fishery Products" that requires processors of fish and fishery products to develop and implement Hazard Analysis Critical Control Point (HACCP) systems for their operations. The regulation became effective December 18, 1997. The agency also published the "Fish and Fishery Products Hazards and Controls Guide" ("the Guide") in September, 1996, to assist processors in the development of their HACCP plans, and to provide information to help them identify hazards that may be associated with their products and formulate control strategies for those hazards. The guide was developed to coincide with the issuance of the final regulation. A large number of questions have been raised by the seafood industry, regulators, consumers, and others about interpretation of the regulation. 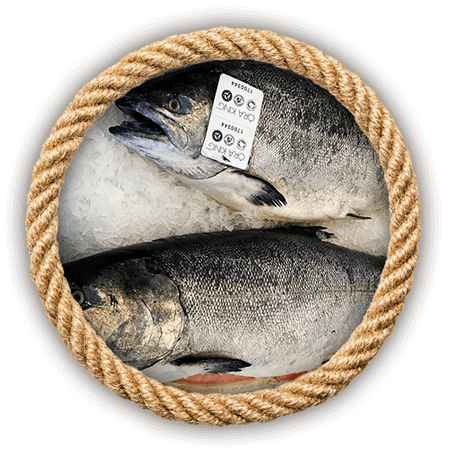 Recognizing this, FDA has developed "HACCP Regulation for Fish and Fishery Products: Questions and Answers" to provide answers to some of the more common questions. Future issues will be printed as other questions are received. Each and every day, we process tons and tons of fresh seafood. We service some of the nation's largest food service distributors, as well as some of the most discerning clients, chefs, restaurants and institutions in Illinois, Minnesota, Wisconsin, Michigan, New York, Pennsylvania, Kentuky, Ohio, Colorado, California, etc..
Wereceive hundreds of seafood shipments per week, from all points, from Alaska to Canada, from the Gulf to Europe, the Medeterranian, South America, the Pacific Islands... And we ship thousands of orders per week to all points throughout the nation. We have a full fleet of refrigerated semi trailers, box vans and panel vans shipping daily. 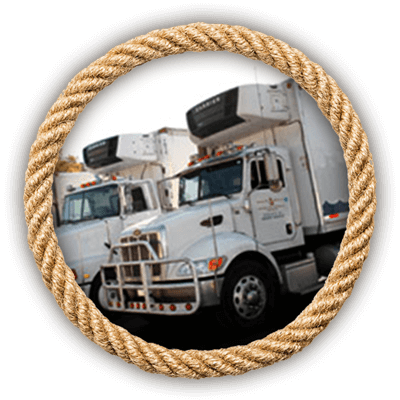 We employ professional drivers who understand the product they are hauling and understand the importance of each and every delivery. Let us know your particular needs and challenges and we'll come up with a solution that works for you. The Boston Seafood Market team has been in the business for a very long time. 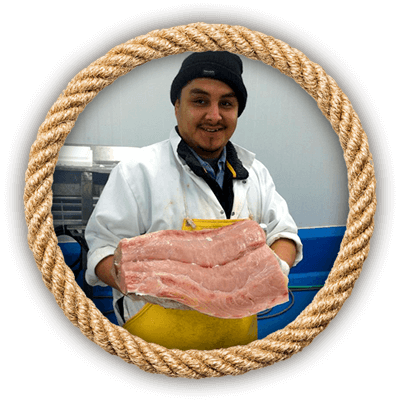 We have years and years of appled experience, from fishing operation to wholesale distribution, restaurant management and purchasing to front-line kitchen experience. We know fish. We know what separates great product from average product. We know what our clients are looking for and we know the reality of their day-to-day needs. Boston Seafood Market sources fresh and frozen product from all points north, south, east, and west. Our fish comes from all points around the globe. We carry the largest array of species available. If we don't currently offer what you need, we will find a way to source it for you. Our personnel is friendly and, as mentioned, incredibly knowledgable. Our goal is to please every client, every day, and to provide the perfect fit. Successful clients are happy clients. And we like to believe that we can help our clients succeed by providing top-quality product for a fair price with the type of consistency our clients can count on. Our product is top-notch, every single time. Our suppliers know that we only accept the best product available. The last thing they want is for us to send something back because we refuse to pass it along to our Clients. And we refuse to pass along product that fails to meet our standards of Fresh. Our clients depend on us day-in and day-out. And we refuse to let them down by compromising on quality. Second only to quality is consistency in product. We know our Clients need to be able to count on high-quality every single order. And it is our job to make that a reality for them. Boston Fish Market demands consistent product from our suppliers so that we can deliver consistent product to our Clients time and time again. An advantage of being one of the nation's largest wholesale distributors of freah and frozen product is our ability to pass quantity saving onto our Clients. Savings of 5-10 cents per pound over a year can amount to a great deal of money. If it can be sourced, we can source it. If it can be delivered, we can deliver it. Need something expedited? No problem. Need something no one else can provide? We'll find it and get it to you.